This was one of the most exciting Olympias in recent history. At the end of the second round, JAY CUTLER was 6 points in front of Ronnie – but at the evening show, Ronnie posed his heart out to win the final two rounds. It was a close call, but the Master pulled it off. Then tension on stage during the posing round is clearly mirrored back stage in this exciting pump room video. Held at the Mandalay Bay Resort & Casino in Las Vegas, bodybuilding capital of USA!! This was one of the most exciting Olympias in recent history. At the end of the second round, JAY CUTLER was 6 points in front of Ronnie – but at the evening show, Ronnie posed his heart out to win the final two rounds. It was a close call, but the Master pulled it off. Then tension on stage during the posing round is clearly mirrored back stage in this exciting pump room DVD. You will see all of the competitors in closeup at the evening FINALS pump room. This historic DVD is shot with 2 cameras before the guys go out on stage for their posing routines. Also prior to the final posedowns and presentations. 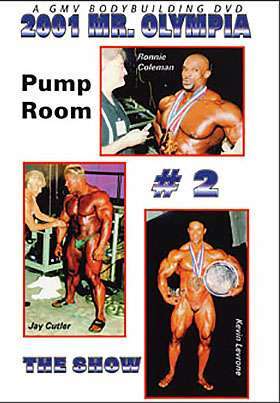 There is some wonderful footage of Ronnie and Kevin Levrone, Craig Titus, Dennis James and many other big names. Any footage of Tom Prince is rare as we have very little on him. You will also see the top guys posing for photos in the PHOTO BOOTH. All of the competitors seen in the DVD are listed in the RESULTS below.